Not perfect, but it's an almost essential mixing aid at this price, giving plenty of useful information on multiple channels. Simple to use. Collision view is a great idea. Useful display and resolution options. Deharmonize can be very useful. Collision mode needs refining. CPU hit unpredictable. Manual not very explanatory. One of the most important things to learn about mixing is that every sonic element needs its own space in the frequency spectrum. It doesn't matter how much you turn two elements up, if they're fighting for space in the frequency range, neither will stand out. You need to cut back the bits that aren't key to each sound. But what to cut? 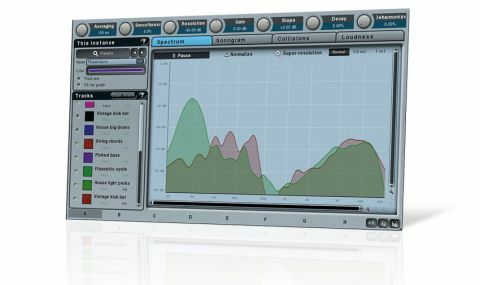 MeldaProduction's MMultiAnalyzer plugin (VST/AU) is here to help. "Insert MMultiAnalyzer on all the channels you want to analyse and all of them become accessible through a single interface"
Insert MMultiAnalyzer on all the channels you want to analyse and all of them become accessible through a single interface. This means that you only need to open one plugin instance to control the whole lot. To keep such a setup easily navigable, you can set a name and corresponding display colour for each channel. There are four views in MMultiAnalyzer. The first is Spectrum, which shows the frequency activity for each channel, overlaid in a way that will be familiar to anybody who's used a spectral frequency analyser (such as Voxengo SPAN). Thankfully, you can hide whichever channels you don't need to see, preventing visual overload. You can also fill the colour-coded graph for any channel, making it much easier to keep track of, say, a vocal for which you're trying to make space. We'd quite like to see a musical scale in addition to the frequency scale, though. Next, the Sonogram is a vertically scrolling view (over time), with thickness of shading representing the volume level at any given frequency (along the horizontal axis). It also layers the selected channels on top of each other, giving a good overview for finding trouble spots, so it's a good place to start your overall analysis process. If you see loads of colours overlaid, that's most likely the cause of any sonic "blurring" you're hearing. Then comes the extremely useful Collision view, which analyses two channels and shows their collision points (ie, frequency clashes). Like the sonogram, coloured shading is used to indicate signal strength at a particular frequency, but this time there is no scrolling time axis - instead, you see three horizontal 'bars' that light up in real time. The upper two bars show the frequencies present in the source signals while a lower bar indicates the frequencies present in both. "Whatever your skill and experience level, it's endlessly useful, and at this price it's pretty much essential"
Figuring out exactly what frequencies these collisions are at, though, is a little unintuitive; we found ourselves spotting collisions using the Collision view but deducing their frequency and by how much we needed to cut using the Spectrum view. For this reason, we reckon there should be a view that combines the Collision and Spectrum views. The final mode is Levels, showing the levels for all selected channels in one window. This view isn't quite as life-changing as the others, being largely what you can already see by looking at the mixer in your DAW. Our one gripe with MMultiAnalyzer is the documentation: this kind of tool is only useful if you know how to use it, and there's more information on that in this review than in the manual! Once you figure out what you're doing with it, though, MMultiAnalyzer really is a superb multipurpose analysis tool. Whatever your skill and experience level, it's endlessly useful, and at this price it's pretty much essential. It isn't perfect, and there are some minor refinements we'd like to see applied, such as larger fonts and buttons, but if you're serious about mixing, it'll quickly become one of your go-to plugins.